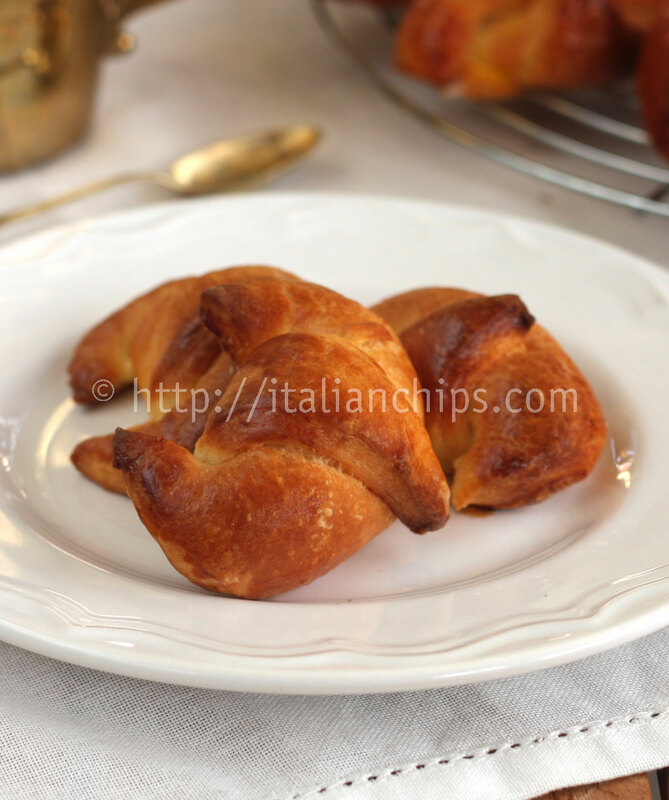 There was a sort of flattering between me and the Italian croissant recipe. I’ve been courting with it for months. Searching here and there, but not yet decided enough to try it. Sometimes there was too much butter involved, other times too much long instructions. Until today when I found “my” recipe :-). 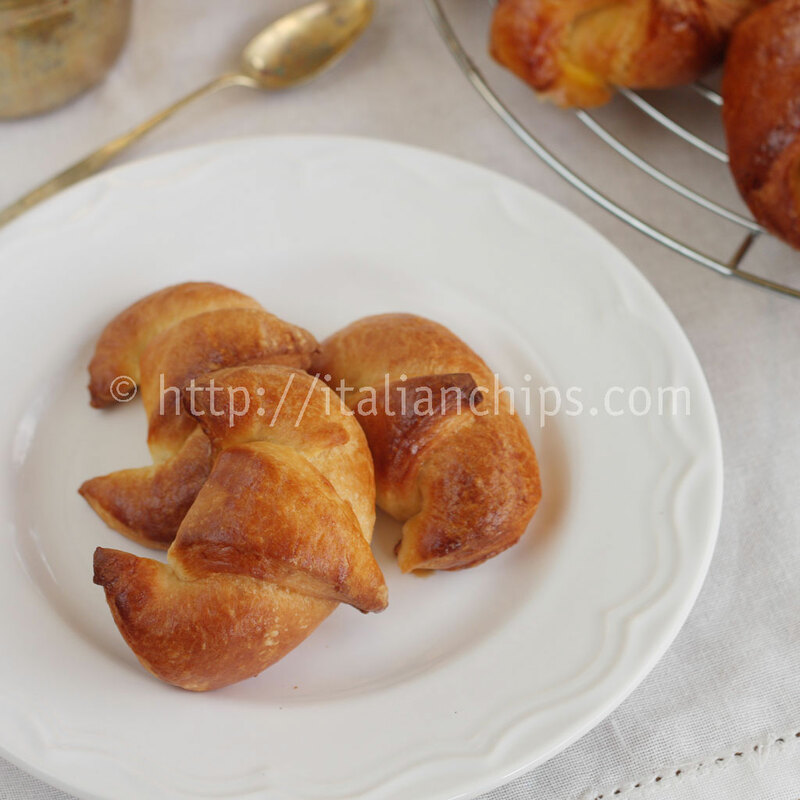 Well, as I live in Italy, it is a recipe I was dreaming about because I do like so much to have a cappuccino in the middle of the morning with an Italian croissant – called cornetto here in Italy. Coming back to Italy, fresh pastry is a must in all bars during the morning. If you search for them during the afternoon you may not find any because they are baked to be eaten fresh, the same day. 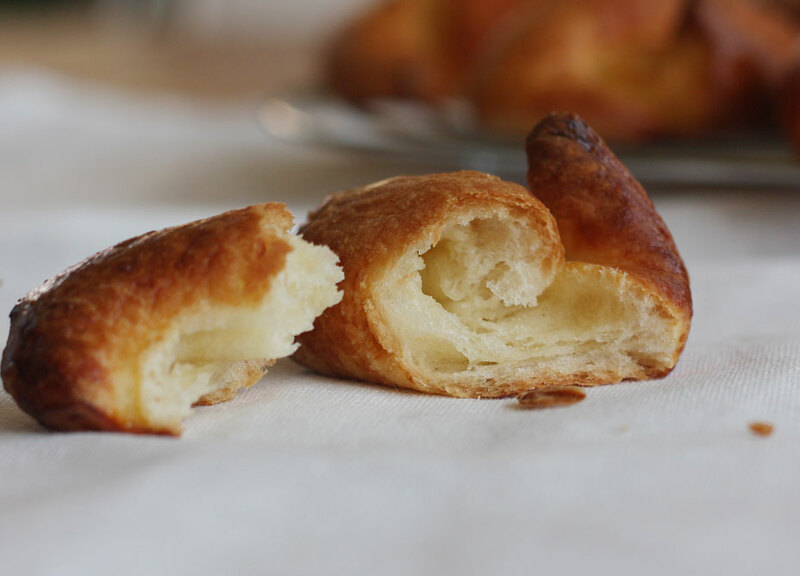 The most classical Italian croissant is the empty one (my favorite), shortly followed by jam and cream filled ones. Nowadays pastry shops are enlarging their offers with new flavors like whole wheat croissant filled with honey and so on. Prepare a batter with 90 ml of milk, 70 g of all purpose flour and the baker's yeast. Put the butter, the sugar and the yolk into your kneading machine or on a kneading surface. Add the remaining flours, the salt and milk and mix until it looks like crumble. Add the yeast batter you prepared early and work the dough for 10 to 15 minutes. It should become soft and elastic. Cover it with plastic wrap and let it rest in the fridge for about 1 hour. Take the butter for the tournage and put it between 2 large pieces of plastic wrap. Spread it enlarging it and forming a rectangle. Take the dough from the fridge and roll it out with a rolling pin. Take the butter sheet, eliminate the plastic wrap and place it on a half of the dough. Close it using the other half and adhere the extremities, helping it with your fingers. Using the rolling pin roll out the dough forming a rectangle, with the shortest part close to you. Then take the ⅓ of the upper part and fold it towards the center of the dough. Take the other extremity (bottom) and do the same upward. Round it 90° and roll it out again repeating the process. Cover with plastic wrap and let it rest for 30 minutes in the fridge. Repeat the tournage for 6 times (roll out, fold up, fold down, turn 90°, roll out, fold up, fold down). After that, roll the dough out the thinner you can and cut it in triangles. Enroll each triangle beginning from the largest part to the peak. 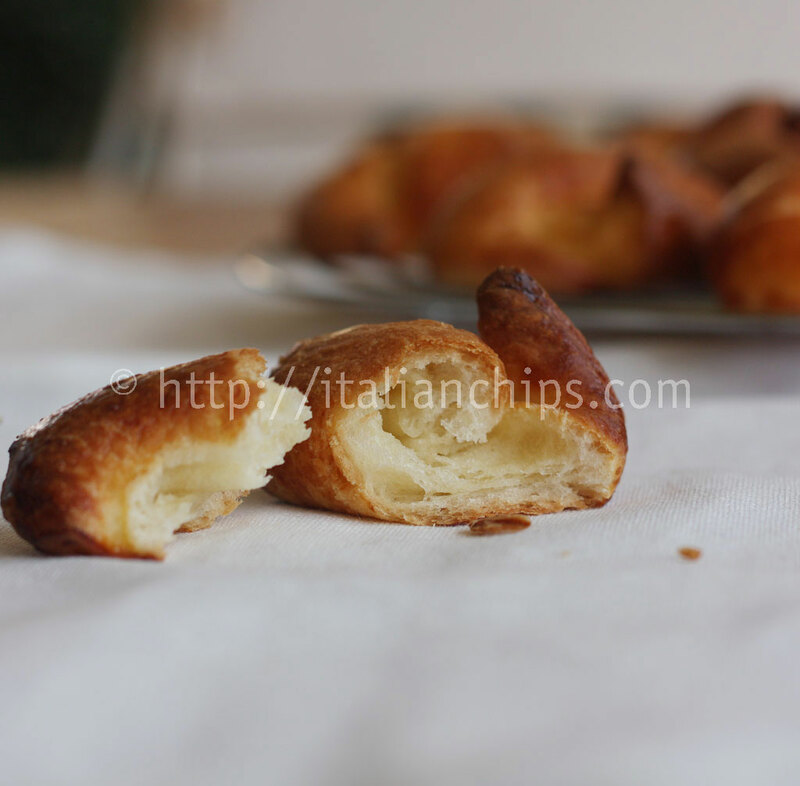 Turn the extremities to the inside to give it the Italian cornetto shape. Place them on a baking tray covered with parchment paper. Cover with plastic wrap and let them in the fridge for 1 night. Take them out of the fridge and let them rest for another 2h30min. 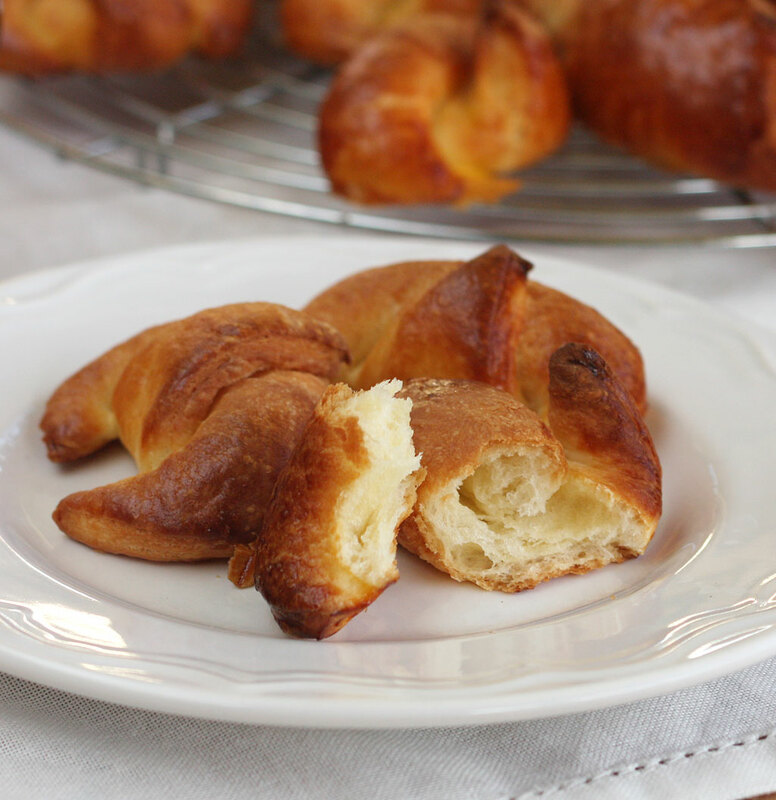 Beat lightly an egg and brush each croissant before baking to give them that golden color.